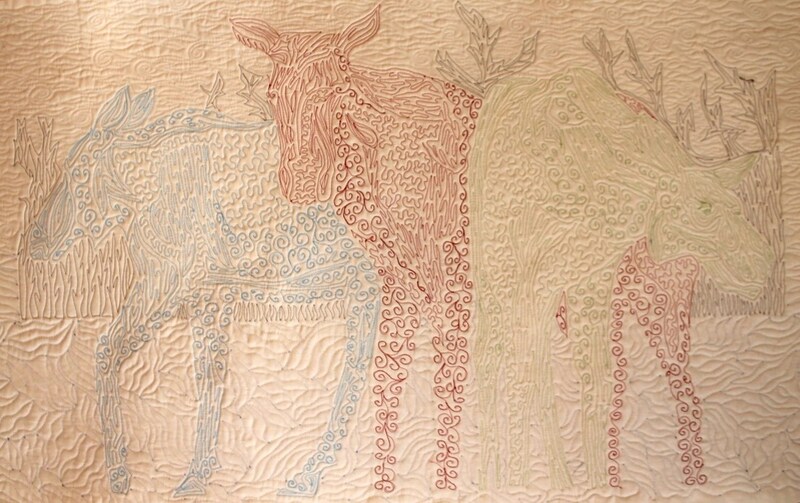 This the back of the Moose Madness quilt, scroll to the bottom to see the front! To start with, you need a free motion foot. ** Then you need to disengage/lower the feed dogs if you can. If your machine doesn't do that, you should still be able to do it, they’ll just bounce up and down. On my machine they aren’t a problem at all, I don’t always lower them. The free motion foot doesn’t put pressure on the feed dogs, so you can move in any direction when you sew. Because the feed dogs are not activated, you are in complete control of the stitch length. The length of the stitches is determined by how fast you move your hands in relation to how fast the machine is going. It takes a little practice to get used to that. Generally, the sewing machine needs to be going pretty fast, and your hands fairly slowly. One tip is to lower the speed on your sewing machine if that is an option, then push the pedal all the way down. That way the machine will be going at a constant speed, and all you have to worry about is how fast your hands are moving. Try moving your hands faster and slower and see what happens to the stitch length. Make a quilt sandwich for practicing on, two layers of fabric with batting in the middle. It is possible to free motion stitch on one layer of fabric, but you really need a hoop and a stabilizer to do that. To start stitching, it’s helpful to do one stitch, then pull the thread so the bobbin thread comes to the top. Hold the threads out of the way while you do a few small stitches, then cut the thread tails off. You can stitch completely freehand, or you can draw a design on the fabric if you’d like. In my classes, I start by having students make a name tag by stitching their name on muslin fused to stiff interfacing :-). You are pretty much drawing with the sewing machine, it’s just that you are moving the paper instead of the pencil. Remember, you can move the fabric in any direction, you don’t have to turn it around. We now have a You Tube video tutorial too! Feel free to contact me if you have questions! ​My quilted greeting card patterns are a great way to practice on a very small project! To make smooth curves, use smaller stitches and go slowly around them. If your bobbin thread is showing on the top, lower the top thread tension a bit. If your sewing machine bounces when you go fast, try a more solid table, it really makes a difference! Thread sketching is like drawing with your sewing machine. You use it like a pencil, or colored pencils since you can change colors. You can outline or fill in, just as you would with a pencil. 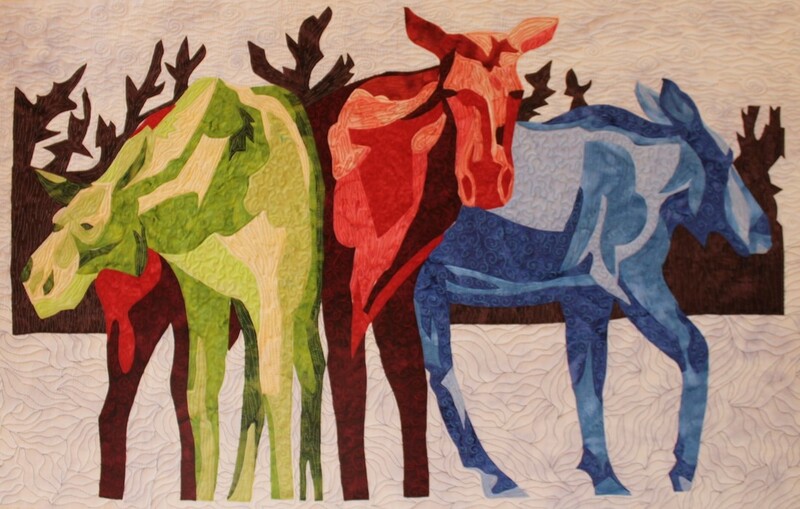 Thread sketching is the same as free motion quilting as far as how you do it, so read the above if you skipped right to here:-) But thread sketching usually involves a higher thread density, which requires more stability to avoid warping your project. There are many stabilizers on the market, both leave-in and removeable, and I do use those. (The wash away ones can be used to trace your design onto as well, and then washed away) But I also always use a hoop, which I think is the most helpful of all. Any embroidery hoop will work, as long as you can get it under your machine's free motion foot. 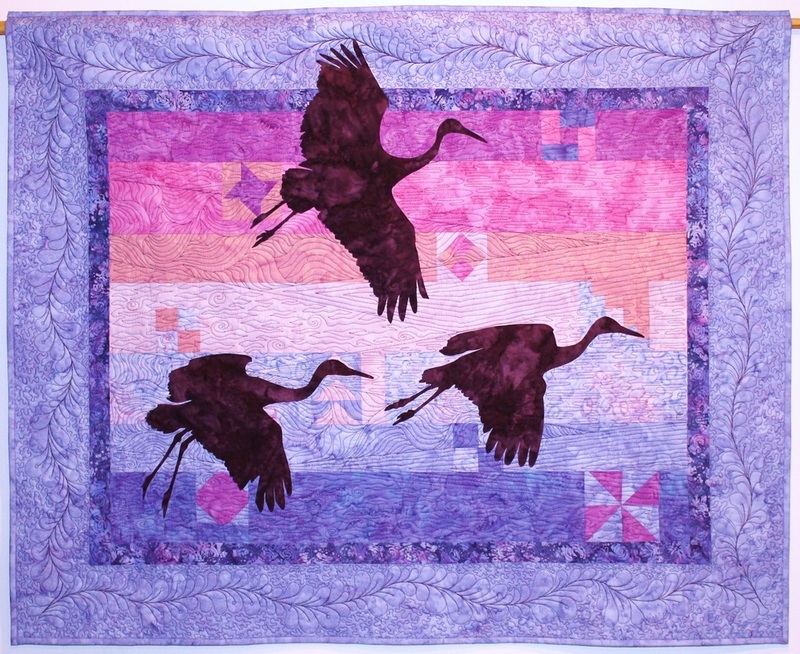 In this quilt, the background is one piece of batik fabric, the rest of the design is thread. My Tundra Swan greeting card pattern is a good small project to practice this on. Feel free to contact me if you have questions! Click here to see all of my patterns and kits!